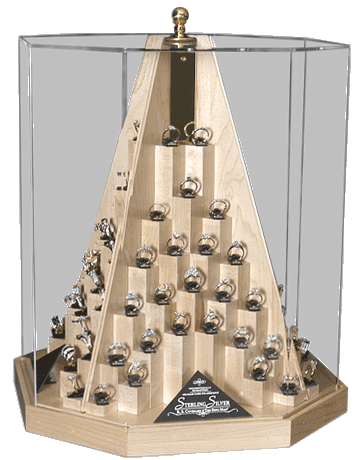 Presenting the Grandmother of all ring displays! Lovingly referred to as Big Bertha, this display features 96 styles in a most attractive manner. Divided into 4 sections, each of which displays 24 rings, this baby really does the job. Depending on your preference, it is available in either a Pyramid or an Octagon shape, and we can build it in the hardwood of your choice. This display is 15” square and 18” tall.